“I would NEVER be sitting on the couch reading a book now, if I was home,” said G, just now. Why is that? Why don’t we let ourselves rest, relax and re-set when we’re home? Why do we have to “get away” to be idle? Idleness incubates creativity. It’s a fact. That’s why you should let your kids be bored. It will force them to encounter who they really are, and come up with ways to amuse themselves that will show them what they love to do. The same thing with grown ups. Don’t mow the lawn or fix the fence or check Facebook. Let yourself be bored. Then watch what you do. Don’t do chores or work or check your phone. Then prepare to get squirrely. Hang in. Eventually you will gravitate to something. Maybe you will go for a run or pick up a novel or a sketchbook or your pen and your journal. Maybe you will scratch around in your garden–not because it needs to be weeded, but because you love to play in dirt. When people tell me they don’t know what they want to be when they grow up, I say, “Watch what you do when you procrastinate.” Do you play your ukelele? Do you try out a new recipe? Today G and I woke up early and went out to the Ding Darling Nature Preserve. We rode bikes and saw roseate spoonbills and cormorants drying their wings in the sun. 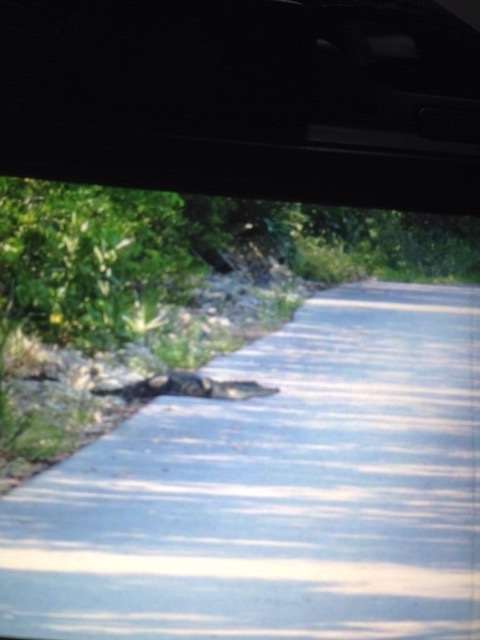 An alligator blocked our path. Uh-oh. I like to do this blog. It has become a source of real pleasure lately. I was forcing myself to post every day back in March, and now there is no forcing. So, today has been brought to you by the letter “I” for Idleness. I hope you find some for yourself. It would be lovely to know how idleness enriches you. What do you do to be idle and blessed?